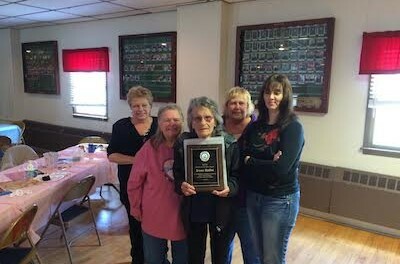 Irene Sallai (center) with her award. Image courtesy of Nick Giordano. 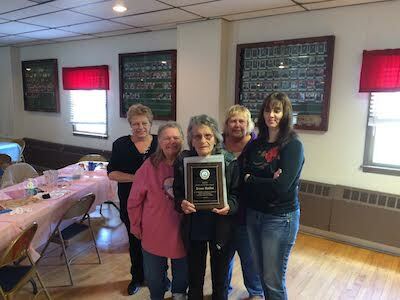 FRANKLIN, NJ – Irene Sallai was honored with Franklin Borough’s Senior the Year Award for 2015. Sallai was honored at the borough’s Senior Spring Fling on Saturday, April 11, coordinated by the recreation committee, with help from Sussex Bank and the Martinez family. Sallai has served overall in volunteering for Franklin. She was previously an active member of the recreation committee for more than 30 years and served as the Recreation Committee Assistant Director during that time. She was one of the residents who helped to coordinate dances at Franklin’s Neighborhood House. Sallai began organizing a country line dance group more than 20 years ago, which still remains active within the borough. She additionally helped to run Franklin’s carnivals when they were held, coordinating the day’s events from setup to clean up. Sallai has been an integral part parades and bazaars, appearing in costume as characters that varied from the Easter Bunny to a Teenage Mutant Ninja Turtle. She has been a longtime employee at Walmart since its opening in the borough. 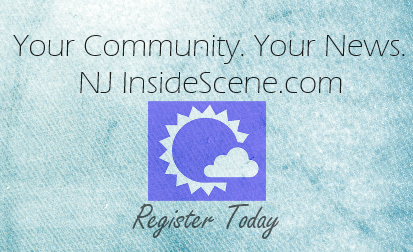 Editor’s Note: Congratulations to Irene Sallai from NJInsideScene.com on this honor, for her many years of service to Franklin Borough.